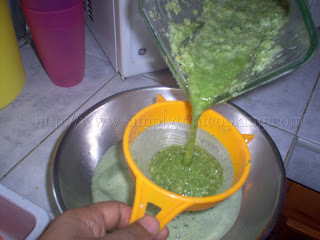 Today’s recipe, is Green Seasoning which, to me, is the real secret behind our trini cooking.When we’re making green seasoning here in Trinidad and Tobago, everyone has their own way of making it. The ratios of some of the ingredients may differ but no matter how it’s made one thing remains the same, it’s green and it’s delicious. In fact I knew of a guy that loved green seasoning so much that he used to eat it between two slices of bread. Yes! It could be that delicious sometimes to some people. From our favourite stews to the wonderful exotic curries, green seasoning lays the foundation to that signature trini taste. When meats are marinated with this mixture of fresh aromatic herbs the results are amazing. The green seasoning permeates down to the bones of the meats when it is properly marinated and only then, you can really attempt to make any of the other trini dishes with success. So it is that simple..If you want to cook like a real Trini learn this recipe first. 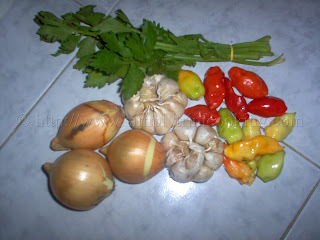 Are you ready to make green seasoning Trini style? Here’s green seasoning. It doesn’t get more trini than this. 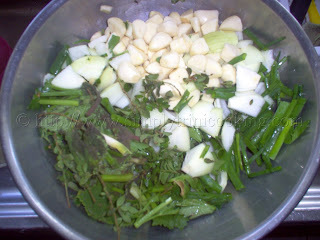 Chop the above ingredients and add to chive, big leaf thyme, chadon beni and spanish thyme. about 1/4 cup of vinegar in the blender. 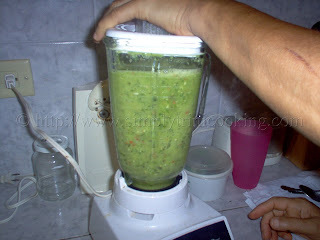 Note: Add handfuls of the ingredients at a time and make sure the blender’s cover is tightly secured. 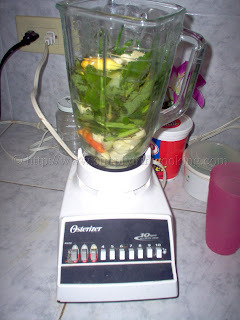 The ingredients will have to be blended in batches! You may add the hot pepper at this step if desired. Strain the green seasoning mixture and collect the liquid below. The liquid will be reused to blend the other batches of ingredients. 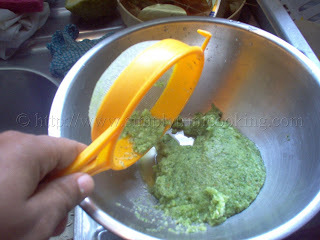 Collect the strained mixture in a separate bowl. Store in containers and refrigerate. Simple wasn’t it? 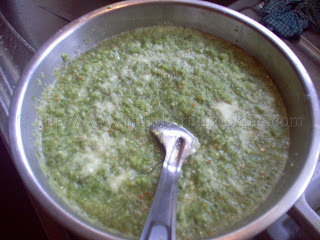 The green seasoning lasts a long time if it is refrigerated. I personally prefer this type of fresh seasoning than the store bought kind that’s riddled with MSG and other preservatives. I hope you enjoy making this green seasoning recipe as much as I do. Bye! Don’t forget to leave your comments about this Green Seasoning recipe in the comment box below. I don’t have pimento peppers were I come from. (Small town, lol), could I substitute the pimento peppers with a small to medium sized bell pepper instead? It would taste different but I guess if that’s what you have, that is what you would have to use. I must say that you have the most detailed recipe blog for trinidadian food. very good for you. where would i find Culantro (chadon beni)leaves? Try any Asian store and look for Culantro, it would be in the fresh herbs section, it’s easy to miss, so look carefully. I am familiar with fine thyme leaves, but not famliar with spanish and big leaf thyme. Any suggestions as to where to buy them? Thanks!! where do you get it in NY? Quick question – maybe I may have asked you this before – can you confirm the “36” (as in thirty six) leaves of chadon beni? As soon as I get back to Trini I would like to make this but wondering if the chadon beni might overpower? Thanking you for your reply! I’ve noticed that, after I’ve made the seasoning and refrigerated it for some days, there is a liquid layer on top. I only put a few capfuls of vinegar (definitely not 1/4 cup) and no water. What causes this separation? Should I pour it off or just stir it back into the seasoning? Happen to find this Caribbean Food blog by accident researching reading up on Shadow Benny. I’m guessing it was no accident though. I’m from St.Kitts and love the blog, first one I’ve seen on Caribbean food. First recipe for green seasoning I’ve seen made with so many different Thyme. I love it. Keep this Caribbean blogging goodness going. It’s appreciated allot living in the US with not much access to Caribbean food when you live in odd states without much Caribbean communities. A website blog like this helps LOTS! Thank you Henry for your kind words. It is really appreciated. And I would do all I can to keep the Caribbean Spirit of Cooking alive in the hearts of all; home and abroad. What is Big Leaf Thyme… Spanish Thyme is what we call Cuban Oregano…it does get confusing, eh? And, is small leaf thymethe Mediterranean kind? LOVE your blog. Breadfruit is in season!!!! Hi Felix. I’m wondering if you know anything about the history of green seasoning? Specifically in Trinidad how and when did it come to be used by all ethnicities? Research on google is coming up short. Any ideas? Hi Niala Gotel. 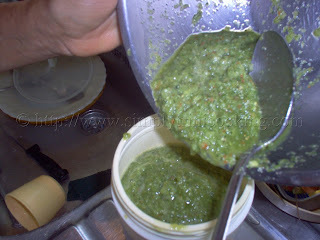 What I am aware of is that our green seasoning is much like Sofrito. Instead, our blend of herbs suit our spicy taste buds here in Trinidad and Tobago. We add pimento pepper (a very mild pepper), hot pepper, chive and garlic. Also, we use a lot of Chadon Beni or Culantro, which is quite prevalent on the islands. Our version of green seasoning is most likely of a Spanish influence (I find it very similar to Puerto Rican Recaito) and shared with the other ethnicities on the island where it took on a life of it’s own.